What a sad story about one of our beloved greyhounds. 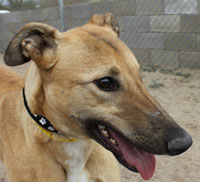 She came to Arizona Greyhound Rescue in Feb. 18, 2011 without paperwork, without racing history. She was adopted soon thereafter. Earlier this year was rebounded back because of some family issues. It happens during these tough economic times. She luckily went to foster care with Shirley S.
Last week Luna who was known as Tulip went to the Rainbow Bridge; she was only 2 years old. She died from Lupus, an autoimmune disease. Lupus attacks the immune system and views the total body as an “invader.” She was fostered and given extensive medical care, but the Lupus won out in the end. She is now running free. Rest in peace dear sweet Luna Tulip.